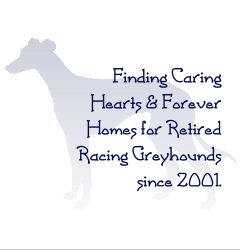 If an adoptable Greyhound doesn't have any symbols by their name it could mean that we have not yet had a chance to test them with small animals or children yet, or that we haven't yet had a chance to update their profile. If a dog's profile says nothing about what you would like to know, please call the kennel or drop us an e-mail at adopt@northerngreyhoundadoptions.org - please leave a a phone number for someone to get back to you with as most often questions are answered better during a conversation than over e-mails - thank you! - Small Animal/Cat Safe - we do cat and small animal test and this symbol means that so far the dog has tested as "safe" or disinterested in the small dogs or cats it has had the opportunities to meet. Please understand this can never be 100% that any dog will be safe with all small animals, caution is always advised. NOTE - if it seems to you that a lot of the dogs of N.G.A. are marked "cat safe" it is because they have been tested and have either shown disinterest or non-aggressive curiousity. That curiousity may come across as worrisome to some, but it is a behavior that is easily worked on and if you ask we would be more than happy to show you how! It is true that more Greys are capable of being small animal safe than not! - Not Small Animal/Cat Safe - the dog has shown too much interest to the point of possible aggression with the small animals it has encountered. - Unsure if Small Animal Safe - Means either we have yet had a chance to test this dog, or that we think it's possible to work with the dog to make them small animal safe - details in the dog's profile. Not an easy job to train a dog to be small animal safe however and best left to those with experience. Sometimes training is successful, sometimes not, best to not take chances if you have small pets at your home. - Very Fond of Children - most Greyhounds are tolerant of well-behaved children, some are really enthused about being near children. If you see this symbol with a dog it means that dog has been consistently attentive to children, happy to be with them and tolerant of reasonable childish behavior. Some of these dogs that are very fond of children are still to boisterous for very small children and could too easily hurt them by knocking them down - if you have small children or the dog you adopt will be near them often take that into consideration. Remember; dogs and small children should NEVER be left unattended! - May or May Not be Child Safe/Friendly - so far this dog has not shown aggression to any child, nor enthusiasm. Maybe the dog hasn't met "his" child, maybe it just isn't interested in them but will leave them be if they leave him be. Could be a fine family dog with respectful children. Or this could indicate that the dog is semi-interested in children but too boisterous and easily knock small children over ... If this marks a dog you are interested in and you have younger children please ask about this dog's particulars if not detailed in their profile. - Not Small Child Safe - it's a rare Greyhound that does not at all care for children but it can happen. If you have children in your home younger than 12 this may not be the dog for you. - Not Vetted Yet - The dog has not been spayed/neutered yet, so it cannot be taken home just yet. - On Hold/Waiting to go Home - this dog is still at the kennel and someone has put in to adopt but it's not yet finalized, and the dog may still become available! ... If you visit the kennel you'll see the double hearts on certain dogs' kennels marking them as ones that have homes potentially lined up, but the adoption finalization hasn't been reached quite yet. NOTE - If you see this symbol on a dog that you've expressed interest in adopting to us and are worried that hearts means someone else has laid claim, then please do call or e-mail us, most likely they are there for you! - Special Needs Dog - don't pass a special needs dog over! Their issue could be as simple as having a limp that may not go away but doesn't slow them down, or the dog may need daily medication. Details in that dog's profile. Sometimes it's that one dog needs to be adopted with another specific one. - Angel Sponsor Needed - this means the dog has a medical issue that needs taking care of that the kennel would appreciate help with; sometimes to offset the cost of a procedure or regiment that is already being taken care of, or sometimes to take care of something "elective" (like a dental work-up) that the funds can't be spared for just yet. Taking care of the whole bill is nice, but you don't need to do that to be an Angel!